I don't got much in this world. Just what I can fit into my backpack. A blanket, two pairs of socks, a pocket knife, a jacket. And a picture of my dearly departed mother, Rose. But I do have a pole. 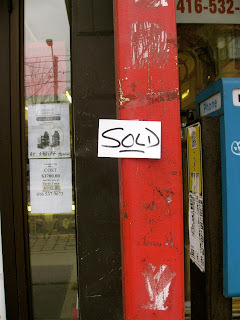 I made a sign that said: "sold," and taped it to my pole so people would know it's mine. It's a nice pole, red and strong. Its got some crud on it, but nothing a little soap and water won't take care of. I didn't exactly purchase the pole, so it can't really be classified as "sold." But then those settlers didn't exactly buy this country from the natives, now did they? Mostly I like to lean on my pole and watch the world go by. I prop my foot up on it which I think makes me look real casual and friendly. Just a happy-go-lucky kind of guy. I lied when I said what I got in my backpack. I have a few more things. A Father's Day card with a picture of some golf clubs on it, cause Sadie knew I liked to golf back then. And a ring. I've still got that damn wedding ring, though I should've pawned it a long time ago. And these dice. I've got a pair of white dice. I like to take them out of my bag and hold them in my hands while I spend time at my pole. They remind me of something important. You want to know what that important thing is? Well, alright. I'll tell you. They remind me its possible to have everything you could want, and then just like that, lose it all. Ah, yes. You are most correct. Thanks for catching that. Despite my personal rule against going back and revising posts, I HAD to fix it. The rules don't count when it comes to splling mistaces. I love this story Britt. Love it.